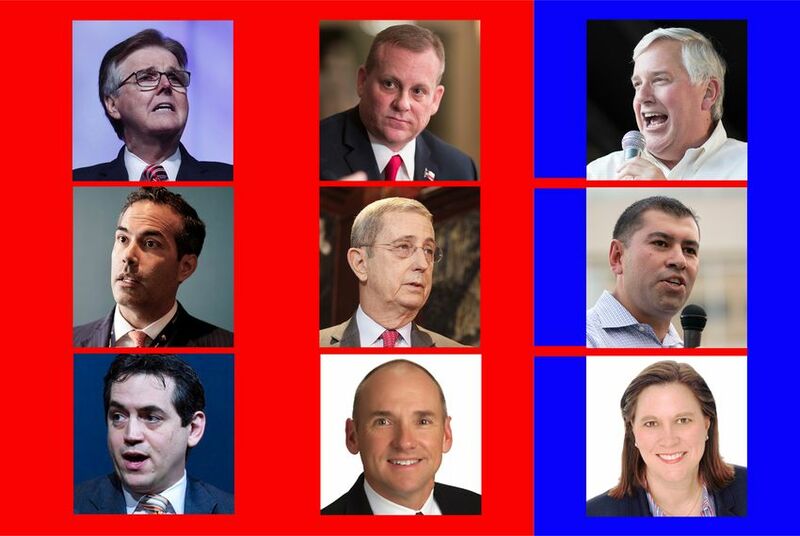 Some Texas Republicans are endorsing Democrats. Is it "Texas over party" or sour grapes? Two statewide officeholders are among the Republican incumbents who have seen former primary opponents take the unusual step of endorsing their Democratic challengers ahead of the midterm elections. On a Friday this month, around two months before the midterm elections, something curious happened in Texas politics: A prominent Republican endorsed the Democrat challenging a GOP incumbent for office. Later that day, it happened again. The cross-party endorsements made on Sept. 14 by Republicans Jerry Patterson and Bennett Ratliff — the former Texas land commissioner and an ex-state lawmaker, respectively — are just the latest examples this cycle of what has historically been considered a rare political move. And it raises the question of whether those endorsements are a sign of shifting party loyalties during an election year that appears to favor Democrats — or just the actions of former politicians with a bone to pick with former rivals. In a number of cases, some political observers say, an argument can be made that it’s both. Take Patterson endorsing Miguel Suazo, the Democrat running to unseat current Texas Land Commissioner George P. Bush, a Republican. Patterson had Bush’s job from 2003 to 2015. He gave up the office for an unsuccessful bid for lieutenant governor, and Bush was elected to the position on his first try in 2014. Patterson decided to challenge Bush for his old job this year — and he, along with two other Republican challengers, fell short in the March primaries. But Patterson insists his endorsement is about “the failures of Bush” in handling the Alamo, the historic battle site that the General Land Office is tasked with overseeing, and Hurricane Harvey recovery efforts — not based on possible bitterness after his loss in March. And, to be clear, Patterson isn’t the only failed Bush challenger who came out against the incumbent; Bush’s two other primary opponents from this year — Rick Range and Davey Edwards — as well as David Watts, a primary challenger from 2014 — signed onto a letter with Patterson saying they would not be voting for Bush in November. Bush, for his part, said through a spokesperson that he hasn’t “had time to focus on” Patterson’s endorsement against him. “My priority is the job I was elected to,” he said in a statement. A similar situation is unfolding in North Texas, where Ratliff, a Coppell Republican, announced he was backing Democrat Julie Johnson over GOP incumbent Matt Rinaldi of Irving. Ratliff and Rinaldi have battled over the House District 115 seat for years through consecutive Republican primaries. Ratliff edged out Rinaldi in 2012, holding the seat for two years before Rinaldi beat him in 2014. Ratliff had an unsuccessful comeback bid for the seat in 2016. Their rivalry is also emblematic of a rift within the Texas GOP between hardline conservatives and others aligned with the more centrist wing of the party. Rinaldi, a member of the Texas House Freedom Caucus, is considered part of the former, while Ratliff, who touts himself as a “Main Street Republican,” is looped in with the latter. Ratliff says his endorsement of Rinaldi’s Democratic challenger is in large part about electing someone who will fight for the state’s public school system — something he thinks Rinaldi has failed at. (Rinaldi told the Dallas Morning News that such a claim by Ratliff was false). And Ratliff, like Patterson, denies hurt feelings over past losses drove him to endorse the Democrat in the race. Rinaldi lumped Ratliff’s endorsement of Johnson in with Patterson as well as Scott Milder, a Republican who lost to Lt. Gov. Dan Patrick in March and threw his support behind Mike Collier, the Democrat in the race. “In November, I will be casting my votes for the Republican candidates in every race with one exception,” Milder wrote in a post on Facebook after the primaries. He called Patrick “the biggest bully in Texas” — and described Collier as “the rational Democratic nominee for Lieutenant Governor.” Like Ratliff, Milder also criticized Patrick on the campaign trail over public education. Various other cross-party endorsements have also happened this cycle, including in the race to replace Republican state Rep. Jason Villalba of Dallas, who lost his re-election bid earlier this year in a heated primary. Lisa Luby Ryan, who successfully ousted Villalba by arguing to GOP voters that he wasn’t sufficiently conservative, is facing off against Democrat John Turner. Villalba, who has been critical of Ryan since his defeat, said last month that “the district is clearly a centrist, chamber-of-commerce district” — a wing of the GOP, he adds, that Ryan does not represent. While Villalba hasn’t taken the route of other defeated candidates like Ratliff and Patterson and endorsed the Democrat in the race, he has made a point of not endorsing Ryan either. And Turner, the son of former U.S. Rep. Jim Turner, D-Crockett, released a letter of support in August from some in the Dallas business community — which included signatures from a number of people long associated with Republicans, including former state Rep. Jim Pitts of Waxahachie. Pitts, who, like Villalba, was aligned with the more centrist wing of the GOP during his time in office, amounted his endorsement to his friendship with the Turners. “I have known John’s family most of John’s life,” he said. “Turner is an easy candidate for me to back.” Pitts declined to elaborate on why he waded into a race outside his old state House District that involved a Republican running to carry the mantle in a GOP-held seat. The Democrats in all of these races, for their part, are welcoming the endorsements from Republicans with open arms. “I welcome the support we’re getting from Republicans,” Turner, the Democratic state House candidate, told the Tribune this month. “It’s a unique year in politics — and a number of Republicans aren’t thrilled with the direction their party has gone.” Johnson, the Democrat challenging Rinaldi, tweeted that she looked “forward to reaching across the aisle to solve the real problems plaguing TX instead of creating them w/ harmful rhetoric & outlandish behavior as the incumbent has done for 4 years.” Suazo, the Democrat running to unseat Bush, said he was honored to have Patterson’s endorsement. The number of prominent Texas Republicans endorsing Democrats this cycle remains fairly small, though those numbers could grow before Election Day. Milder tweeted this month that a third party of “Rational R’s and rational D’s” is rising in Texas. And Ratliff said there’s ample time for other “Main Street Republicans” to endorse more Democrats in key races where the GOP candidate is unacceptable. “I don’t think it’s over,” he said.